If you are upgrading your cell phone and your friend or family member wants your old iPhone 3 or your Samsung Galaxy v.1 (or even that old Moto Razr!) that totally counts as recycling. Pat yourself on the back and tell everyone to call you “Green.” The point here is that you don’t have to send your device away to a program. You can just give it to someone you know. Cells for Cells is the back-up plan if nobody wants to use your old device. Cells for Cells always encourages companies to have an employee collection drive once or twice per year. Make it fun. Challenge other managers or office friends to bring in the most old cell phones from home. The winner should have his / her lunch bought by everyone else! Ferrellgas Propane had an East Coast VP versus West Coast VP and the “losing” VP (the one that collected the least devices) had to wear a pink flamingo hat and have his picture taken for all of the world to see. If your company is going to run a Cells for Cells drive, have a ton of fun doing it. Your neighbor probably has as many old cell phones as you do. The cell phone industry is still suggesting that EVERYBODY in the US has 3 or 4 old devices laying around. It gives you a chance to get to know your neighbors a little better and, in turn, your neighbors will recognize you as a resource for recycling. And you’ll introduce the Cells for Cells story to someone new. Thank you for that! Oh, the junk drawer! 9 out of 10 American homes have a junk drawer. (I made that statistic up to help this blog post.) I bet you’ll find at least 2 old cell phones, 7 old chargers, 3 old batteries, Tic Tacs, dominoes, and an Andes mint from the last time you went to The Olive Garden. We have a partner here in Kansas City that opened up their double-door storage cabinet with neat rows of boxes: 2003, 2004, 2005, etc… In each box was that year’s old and broken cell phones. The wireless manager wanted to recycle all of it; but hadn’t yet found a place were he wanted to recycle. He liked the Cells for Cells story and we made his day by clearing up a ton of space for him. I love Wireless Managers (WM’s). They are, by far, the best allies for Cells for Cells. These are the folks that truly keep a company’s workforce in synch. Most of the WM’s that I know are super awesome at troubleshooting and creative problem solving. I admire their abilities. If you happen to know a WM, especially if they bailed you out of a Blackberry or Smartphone problem in the past, you should take them out to lunch! You may even do your WM a favor by telling them about Cells for Cells. Every company wants to do better at being green; but lack the time to start implementing those green ideas. You can be a hero in your company by initiating a conversation about recycling with the President of your company. Commit to spearheading any new green programs from providing paper recycling on every floor to running the Cells for Cells drives. You know who you are. You are the one that wants to make those small changes that, over time, make big differences. And that is what you are about: Making a difference! Okay, it is still early enough in 2012 that all of your New Year’s Promises are fresh in your mind. If you are like most, odds are that you made some promises to yourself about doing more for the environment. Some of your promises may have been doing better at recycling electronics or being mindful of where my trash ends up. I hope that Cells for Cells aligns with some of your promises to make the world a little greener this year. According to Gartner, world-wide cell phone handset sales were 1.211 Billion in 2009. And, the number of cell phone subscriptions are now 4.6 Billion. Can we assume, that included inside of each of those 1.211 Billion new cell phone boxes, is a recycling baggie just like the ones pictured above? Now, consider that the percentage of cell phones being recycled today, fall somewhere between 1% and 10%. If we generously assume that all 10% of cell phones recycled are done so through the baggie program, then we are left with well over 1 Billion plastic baggies that will probably end up discarded in our landfills or our waterways and oceans. This well-intentioned baggie recycling program is a complete environmental failure. Creating more waste, in the name of environmental good, is a shame. When we first launched Cells for Cells in 2007, we provided a simple cardboard collection box to all of the companies that wanted to recycle with us. We distributed hundreds of boxes throughout Kansas City and received back very few. Even though cardboard is easily recycled, we realized that we were creating a lot of cardboard waste. So, we changed our process, and now Cells for Cells encourages everyone to re-use a cardboard box when you ship your devices to be recycled. The cardboard, in turn, will be re-used or recycled. Although most curbside recycling programs do not allow for any sort of plastic bag recycling, there are solutions. I have seen plastic bag recycling containers in some of our local grocery stores. I think that Wal-mart might have plastic bag receptacles, too. Here is plasticbagrecycling.org. They have a state-by-state locator to help you find out where you can recycle your plastic bags. I have an opinion that the baggie program teaches the public to only recycle one or two devices at a time. Why not try to fill a box with old cell phones from family, friends, neighbors and co-workers? No matter what program or charity your cell phone recycling program supports, you still have the option to do more than just recycle. Become an advocate. Make it your mission to have your entire office recycle 2 or 4 or 10 devices per person. Re-use a cardboard box and make a difference in the environment and in the program you support. Cells for Cells announces the winner our it’s first Extreme Medical Bill Makeover giveaway. Dawn and Jeff Wooten of Wichita, Kansas will receive a check from Cells for Cells for $500 to spend as they need as they battle cancer and will receive $500 in services/consulting from Your Wellness Connection in Shawnee, Kansas. On October 4, 2006 my husband Jeff was diagnosed with Multiple Myeloma (a cancer of the plasma cells). What was so shocking about this, besides getting a cancer diagnosis, is that he was only 37 years old. This is a cancer that is most common in people over the age of 65. At the time of his diagnosis, we were living our dream in Alaska. We owned a small business and had decided that it was a good time for me to go to college full time. Because we owned our own business, we didn’t have any health insurance, but we were both young and healthy and weren’t all that concerned about it. Living in Alaska has its perks; however, state-of-the-art cancer treatment wasn’t one of them. On October 18, 2006 we were on a plane heading back to Wichita, KS so we could be near family and meet with some doctors here. They told us that Jeff’s bone marrow was 80% cancer and there was no way we were going back home. With the help of our friends, we sold our house and put our belongings in storage. We moved in with Jeff’s parents and got to work fighting this disease. Over the course of the past two and a half years, Jeff has participated in clinical trials, undergone two heavy rounds of chemotherapy, and had two stem cell transplants. It was almost a year into his treatment before we found an insurance company who was willing to insure him. It wasn’t cheap, but was something we desperately needed. This cancer diagnosis changed every aspect of our lives. Suddenly we found our priorities changing. Things that used to seem so important just weren’t anymore. We decided to stop saying “some day we want to do this” or “someday we want to go there” and we started taking small weekend trips just to get away from it all and spend time together. We didn’t know how much time we had left together so we just started making memories. We had so many people reach out to us and want to help us, and I soon realized how much I wanted to help other people as well. I involved myself with the American Cancer Society and sat on the committee to help plan the Cattleman’s Ball. We started going to support group meetings at a local organization called Victory in the Valley. I volunteered some time working in their office and it wasn’t long before I was asked to head the support group meetings. Unfortunately, our small group started to fall apart so we no longer meet. I am still the contact person for all new myeloma patients and family members if they would like to talk to someone who understands what they are going through. I also learned of the Leukemia & Lymphoma Society and contacted them. I was amazed at how much they do to help people with blood cancers in our communities. I signed our family up as a team to help raise money for Light the Night. 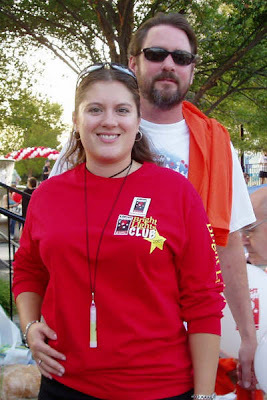 In 2007, Team Wooten raised almost $7,500 for LLS. I can’t even begin to tell you how excited I was and how grateful I felt to all those who supported us. I continue to stay involved with Light the Night, even though we haven’t come close to that number again! We just celebrated Jeff’s 40th birthday this past weekend (his birthday is March 3rd). Two and a half years ago we were told that we might only have six more months together. In one week we have his one year post-transplant doctor appointment and are crossing our fingers that we hear the words “Congratulations, you are still in remission!” In honor of this milestone, I have decided to cut and donate my hair to help give another woman her confidence back. We look at everyone we meet so differently now. You can’t tell just by looking at us that we struggle with this thing every day. There is no cure for Jeff’s cancer. We know it’s going to come back. We just don’t know when and that is always with us. All we can do is be kind to one another, smile at a stranger, and give back whenever we can. That is our story. I don’t know if this is what you are looking for or not, but I still wanted to share it with you. Thank you for taking the time to read it. If helping families devastated by medical bills is worthwhile to you, please join us in this historical endeavor by recycling your cell phones with Cells for Cells. Most importantly, if you know a deserving family, battling cancer, who desperately needs help paying medical bills (perhaps it’s your family or a co-worker’s), please put them in touch with Cells for Cells. Based in Kansas City, Barkley is a full-service advertising and marketing communications firm with some very well-known clients. I am excited that I got the chance to talk to Kelly Francis, Technology Liaison Director for Barkley about advertising, battling cancer, and recycling. Jason: Hi Kelly, let’s talk about advertising. What is your favorite TV commercial of all time and why? Jason: What is your favorite product that Barkley created the ad/marketing for? Kelly: The Two Guys Sonic commercials, of course. People either love them or hate them…either way, they are being talked about. Which of course is still good publicity either way. Jason: What should small or medium sized companies be doing with their advertising / marketing in this economy? Kelly: As the old adage says, “Advertising pays.” While budgets are being cut in just about every area of every company, it is still smart to keep your name/product out there. People are fickle and too easily forget if not reminded often of your product or services. Jason: How easy is it to use a firm like Barkley? Kelly: I’d be happy to put anyone in touch with our New Business department and let them take the lead there. Being in IT, we’re a little sheltered as to how it all comes together regarding obtaining new prospects and business. Jason: What do you see for business in general for 2009? Kelly: We, like most everyone else, are tightening our belts. Business is steady, but a down economy affects everyone. Not that it’s all doom and gloom though. This should be an opportunity for everyone to take stock of what is important and where changes can be made that would benefit everyone. Jason: Fighting cancer seems to be a huge deal at Barkley. You are big supporters of Susan G. Komen. How did that start? Kelly: Barkley was the first ad agency to brand a cause for Lee National Denim Days 12 years ago which benefited breast cancer awareness. The Susan G. Komen Foundation followed shortly thereafter because of being linked to LNDD. Jason: How do you encourage other industries to get behind the fight against cancer? Kelly: Our PR Department is instrumental in our Cause Branding efforts. A lot of companies want to be known for more than just the product they product or service they offer. They want to leave a legacy of giving as well, and we help them find their niche. Jason: Kelly, I know that there are tons of cell phone recycling programs – why is Barkley promoting Cells for Cells? Kelly: Two reasons: I like to use local companies whenever possible …whether I am purchasing items or donating to a worthy cause; and this truly is a worthy cause that I don’t think gets as much attention as some of the more well known and advertised organizations. Jason: What recycling do you do at Barkley? Kelly: We currently recycle paper, cardboard, plastic, aluminum cans, cell phones, electronic equipment (like computer monitors, printers, small electronics, TVs, etc. ), and we are in the process of starting a program to recycle ink jet cartridges and alkaline/lithium batteries. Jason: How long has recycling been a part of Barkley’s culture? Kelly: It’s really grown in the last couple of years since we moved into our current building. We have implemented a lot of “green” processes besides just recycling. We also promote double-sided printing to save paper and use recycled paper products and utensils in our break rooms. Jason: What do your hear your employees saying about recycling in the workplace? sements or garage to be recycled or properly disposed. It’s been a very popular program. Jason: How do you think you are positioned to best spread the word about recycling? Kelly: My role as Technology Liaison Director is about communication. I am known as “The Link” between IT and the users, so I have the opportunity to spread the word effectively via posters in common areas, training sessions, department meetings, and of course via email. Jason: On a bigger scale, what is Barkley doing to promote smarter recycling? Kelly: We actually have a “Green” committee here called “Planet Fresh” that sends out tips for being greener and reducing our carbon footprint. Articles are published in our weekly newsletter that goes out to all employees with things everyone can do to live greener. Jason: Have you or are you working on any major ad/marketing specific to recycling? Kelly: Only internally with information that goes out to our employees with new processes we are putting into place, like the new ink jet and battery recycle programs that will be starting soon. Jason: Do you see the other ad/marketing firms following your lead and participating in recycling programs? Kelly: I’d certainly like to think so! Jason: How do you encourage other industries to get behind recycling? Kelly: I think just by being responsible citizens in general sets a good example. When we are in meetings with people from outside our agency, we encourage folks to put cans/paper/plastic/etc. in our recycle bins. We print 2-sided presentations or in Handout form which puts several slides on one page to reduce paper usage, or even better, we present via the web (no need to print at all!). Every little bit helps. Jason: What is an easy recycling tip that you want to share? Kelly: Junk mail is recyclable. You don’t even need to open it…just put it in the bin. Jason: What is your favorite cell phone advertisement? Kelly: Hmmm…I’d have to say the one with Ozzy Ozbourne talking and you can’t understand him, so he sends a text message…it’s just overall funny. Kelly: I have an AT&T Blackberry Pearl 8100. It’s a couple of years old, fits nicely in my pocket and still works great. If it ain’t broke…well, you know the rest. Kelly: I like to look at everything as possibly either being recyclable or reusable. When you have something in your hand ready to toss in the trash, stop and think: do I really want this to be in a landfill.